Washington, D.C. – The 52nd annual Washington International Horse Show began today with hunter competition for professional and amateur riders, who had the first classes of their divisions and finish for championships tomorrow. 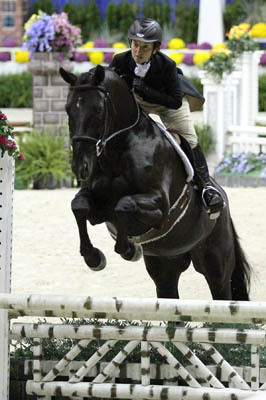 In the evening session, children’s and adult hunter riders reigned the ring. After four years of competing in the $10,000 Adult Hunter Championship, Phoebe Weseley and Just Ask Me finally got their victory. The pair had a first round score of 75 and came back with a vengeance in the second round. They scored 86 for a total of 161 and the win. First round leader Wise Counsel and Jessica Lohman, who rode for Alan Lohman, finished second with a score of 158.5, and Laurie Barna on Laguna placed third with a total of 155.Weseley hails from Bedminster, MD, and has owned Just Ask Me, a 10-year-old Mecklenberg gelding by DeNiro, for more than four years. They placed fourth in last year’s Championship. For this year’s competition, Weseley felt about her rounds, “My first round was good. The five (strides) rode a little tighter than I thought and I had a little rub because I over released in the four to the two. But I fixed it all in the second round,” she remarked.